He is our risen Lord and Savior! Love your cupcake Catherine. Happy Easter to you and your family. Well today I'll be cooking a bit for our family dinner. At noon today we take our Easter baskets to church for a blessing, then tonight is our Easter Vigil, the blessing of light and water and any new members of the church are baptized, we renew our baptismal promises. It's quite a lovely service. (The church is lit my candlelight for the most part) Tomorrow is our Easter Service, and our special family breakfast, we share from our basket of blessed food and then we are off to my sisters(3 of them and their husbands and adult children) for dinner. I'm making the turkey and the soups. (I say soups, cause there will be two, the kids don't eat our usual barszcz, so they'll get celery and pear soup). I need to bake some bread today. Have a Happy Easter Catherine and family. We do it all on Sunday! 2 AM Church Services Where we sing in the Choir, Then the big family arrives after church about 1-1:30 for Easter Dinner and then Easter Egg Hunt and more snacking! Sounds like you had a wonderful Easter, Cathie, celebrating it with family. 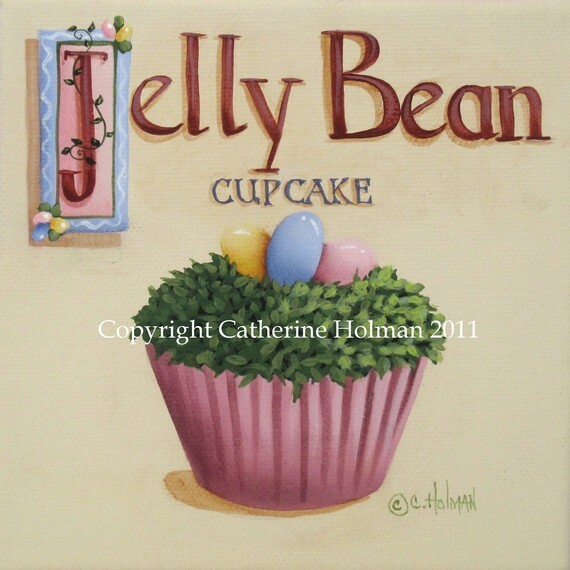 Love your jelly bean cupcake!